BICC designs, maintains and hosts a number of different websites on a variety of topics. Please note that some of the older websites are no longer maintained and can thus be out of date. 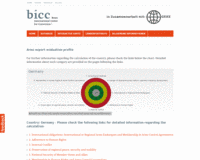 On this website BICC publishes different data sets concerning the military sector, overall security environment, human rights situation and governance in all together 170 countries. The website includes detailed country reports in PDF format on selected recipient states of German arms exports outside of NATO. The reports are only available in German language and were last updated in Spring 2006. Furthermore, a large database examines the correspondence of 170 countries to seven evaluation criteria, which are based upon the EU Code of Conduct. In order to classify each country, BICC pools a number of different data sets, for example from the Stockholm International Peace Research Institute (SIPRI), the World Bank, the United Nations, or Freedom House. 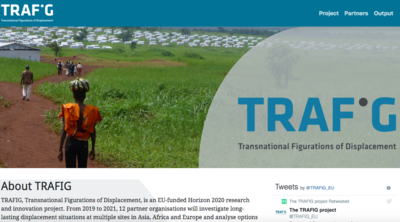 To strengthen scientific networking and to transfer knowledge from academia to policy are two central goals of the research project "Forced Displacement: Research and Transfer" (Flucht - Forschung und Transfer). BICC and the Institute for migration research and intercultural studies (IMIS) at the University of Osnabrück have developed an interactive online-map, which shows the diversity of research on (forced) displacement and refugees in Germany. An open search tool and keywords allow a targeted search for projects from various disciplines and with specific regional focal points. New information portal of the German Federal Agency for Civic Education (bpb) and BICC provides background information on issues regarding security policy. The SALW Guide contains technical details on individual types of weapons, their different versions, and their proliferation. Interested parties will be able to retrieve information that could be decisive for many arms control procedures and projects, including photos of weapons, detailed photos of differentiating criteria as well as photos and sketches of the markings, used by producers and countries of origin, and their position on the weapon. 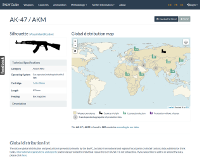 The database also provides information on SALW ammunition. 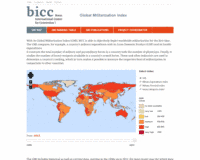 With its Global Militarization Index (GMI), BICC is able to objectively depict worldwide militarization for the first time. The GMI includes historical as well as current data, starting in the 1990s up to 2013, the most recent year for which data has been available. It provides further detailed analyses of specific regional or national developments. BICC’s aim is to contribute towards the debate on militarization and to highlight the often inconsistent distribution of resources. Virtual documentation of the photo exhibition “A CALL FOR ARMS: Community security and arms control in Darfur” in English, French and German. The exhibition was funded by the German Federal Foreign Office. Virtual documentation of the exhibition. 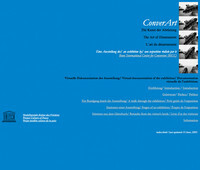 A competition for art students on the theme of disarmament and conversion, organized by the Bonn International Center for Conversion (BICC), which took place in 1998 on the occasion of the 350th anniversary of the Peace of Wesphalia may seem at first sight to be an unusual project for an international research and consulting institute. The theoretical and practical transformation of former military resources for civilian use is, however, a complex and difficult process. Involving the public in this is among the tasks of BICC and, in this respect, every expansion of vision is productive. It was a particularly fascinating challenge to activate the exciting field of art and politics today for this purpose. 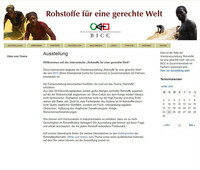 Website of the travelling photo exhibition "Resources for a fairer world", organized by BICC in cooperation with various partners (in German).